Ambassador Danny Danon tell UN Security Council: If terrorism continues, Hamas leadership will be buried in the tunnels of Gaza. The UN Security Council met on Tuesday to discuss the escalation in Gaza. 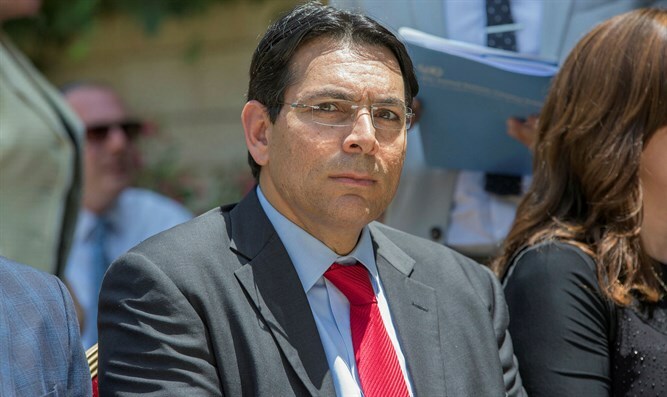 During the discussion, Israel's ambassador to the UN, Danny Danon, called on the council members to denounce Hamas and recognize it as a terrorist organization immediately. In his speech to the Security Council, Danon said, "We will not accept a reality in which our children become targets of Hamas." "Do not be mistaken: If the terror from Gaza continues, the Hamas leadership will feel the strength of the IDF and be buried in the tunnels of Gaza," he continued. "The international community must unequivocally condemn Hamas and recognize it as a terrorist organization." At the discussion, the United Nations envoy for the Middle East, Nickolay Mladenov, warned of catastrophic consequences from escalating violence in Gaza, reported AFP. Mladenov told the Security Council that a "fragile calm" had returned to the region but that the situation remained "extremely tense" following reports that Hamas had agreed to a ceasefire. "I am concerned that we may once again be facing another very dangerous escalation of violence in Gaza with potentially catastrophic consequences," said the envoy. "The last two days have shown how precipitously close we came to the brink of war once again," he added. Mladenov urged the council to condemn the "continued indiscriminate firing of rockets by Hamas towards Israel" and also to call on all sides to show restraint. The terrorist attacks in the Gaza envelope continued on Tuesday despite reports on Monday night of a ceasefire agreement. In one incident, a firebomb which was launched from Gaza in the afternoon landed in an agricultural field in the Eshkol region, causing a fire that destroyed a small area. On Tuesday evening, sirens were sounded in the Eshkol Regional Council in southern Israel. The rocket exploded in an open area near one of the local communities. Later in the evening, IDF warplanes attacked a number of terrorist targets in the southern Gaza Strip, including a military compound and a weapons manufacturing site belonging to the Hamas terrorist organization in Khan Yunis.